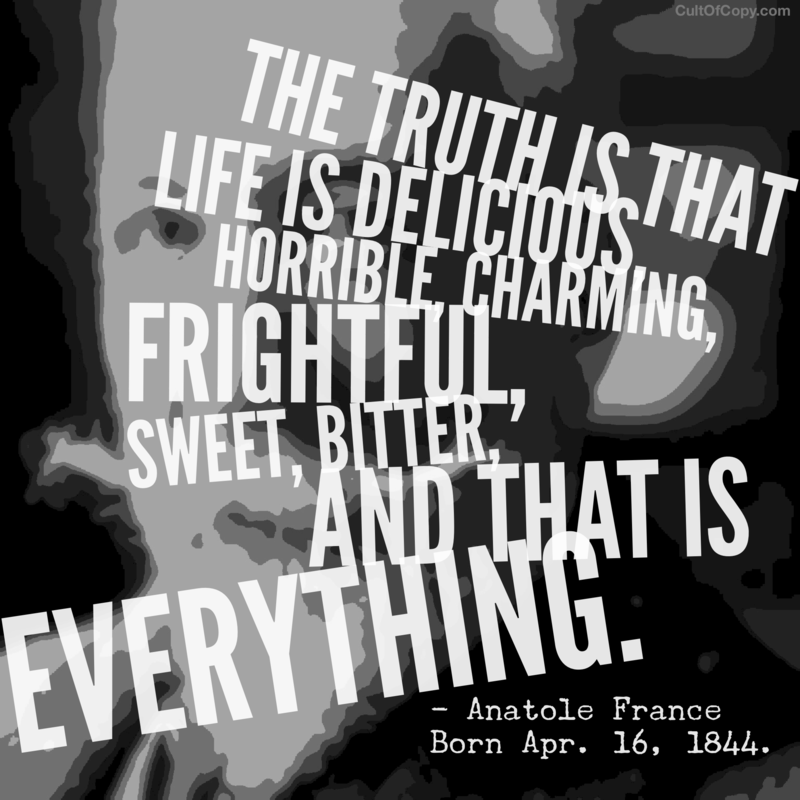 “The truth is that life is delicious, horrible, charming, frightful, sweet, bitter, and that is everything.” – Anatole France, Born Apr. 16, 1844.
Who are you writing to? Robots? No, people. 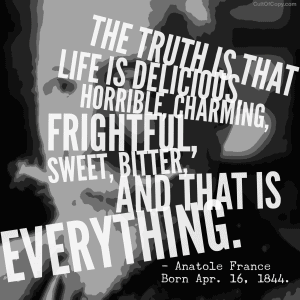 So why write to live, breathing, ambulatory meat bags full of emotion – about boring old “stuff”? People don't care about stuff. They care about the chemical rushes and reactions that having stuff and doing stuff makes them experience. They don't buy things. They buy feelings. So therefore descriptions of things will not trigger feelings in the meat bags. Stories. Sensual ones – that engage the senses. Emotional ones – that engage things like joy and despair and pants-shitting fear. You know, life stuff. Even if it's not stuff they know first hand, people go nuts for that vicarious living that a good story can give them. Either they have experienced this feeling and can directly relate, or else you trigger their natural empathy via their involuntary sympathetic response system. Good stories can stir memories. Of first loves. Best orgasms. Worst fights. Deepest depressions. And to remember a feeling is to experience it afresh. Your brain can't tell the difference between real and fake when it comes to emotions. A sad story can make you cry even when you know it isn't true, right? An incredibly happy story can equally move you to tears, whether it's fiction or real. That's why depending on the emotion, people will pay whatever price for a promise of either the return – or for the avoidance of that feeling you dragged out to the surface.